Life is ever so busy, although I have been crocheting lots and getting better at reading patterns and making up some of my own. Ben is now in school and is really enjoying junior kindergarten. Johnny is in the midst of the terrible twos and keeps us on our toes. I've missed blogging and as I said before I really want to get back into it. Maybe I will make time for it or maybe not. In the meantime, I've shared a pattern for a new set of slippers that I created a pattern for. I'm not a professional pattern writer and sometimes throw caution to the wind when doing things. 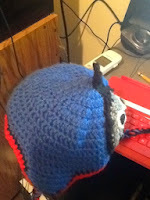 There was a lot of trial and error and a few times of frogging, but here is what I made. Base of the slipper- Crochet 2 bases per slipper. You will then single crochet these together. it makes the slipper stronger and less likely to tear. If you want, you can sew some form of non slip grip to the bottom. Yarn Needle to weave ends in - where possible I try to crochet over the ends so the amount of weaving at the end is limited. Colour A for outer base, Colour B for inner base, Colour C for body of slipper, Colour A, B, D, E for bobbles. I'm not sure how much is needed, but none of it took tons as I used left over balls I had laying around. I used red for the outer base ( I believe RHSS) and Bernat Super Value in gold for the outer base with Bernat green, blue, and beige for the other colours. This is written to make a size 9 ( Candian ) pair of slippers. Adjust according to the size of your foot. This will be worked in a round ( you never turn your work). Any of the doubling stitches should be done at the ends so it is centred. I crochet tightly so adjust so that your doubling is done at the ends and nicely curves around. I highly suggest crocheting both your slippers at the same time so that they both end up the same size at the end ( ie, do the base, then do the stripes of colour, etc). If you need to make any adjustments, write them down as you do your slippers so you can do the same on the second one. See how in my picture all the end stitches are centered in the middle. Once you have your bases sewn together, you will now begin to sc around your slipper with the colours you are going to do the bobbles in. I did three rows of colours. Join with a slip stitch. I did a few gathering stitches ( sctog) around the toe. Evenly place these. ( ie 1 on either end of the toe). Make note of where you put them. I did the rows of colour at the same time so that any gathering would be the same on each slipper. You will then switch to the colour that will be the body of your slipper. I choose a neutral colour so that the bobbles would stick out. Row 2: HDC till you reach where your toes should be. I didn't know how to HDCtog so I dctog here. So 11 DCTOG in a row so that they are centred in the toe area. Then HDC the rest of the way, SL in the back. Row 3: HDC around till you reach where you DCTOG before. 2 DCTOG in a row then gather 4 DC together and gather, then 2 more DCTOG. HDC back around. Row 5: HDC around to the centre, DCTOG 3 times, gather 6 in DC in the middle, DCTOG 3 times, HDC around to the back. 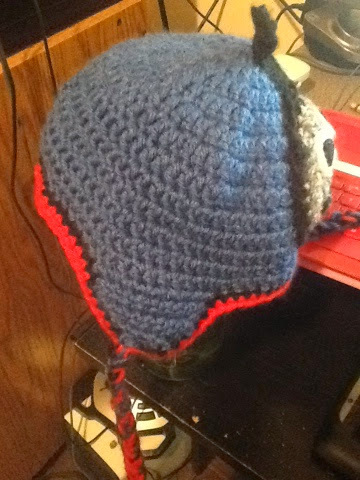 Row 8: Start the bobble stitches. You will make roughly 9 stitches around each opening depending on the size of your slipper. Join your new colour. Ch1, SC, Sc in next stitch, in next stitch do a bobble ( wrap yarn around your hook 3 times, yo pull through 2, yo pull through 2, yo pull through 2 and leave 1 on the hook. Repeat this 4 times do a total of 5). At the end pull through. Single crochet in next 3 stitches. Repeat 8 times. I did not single crochet between bobble stitches as I wanted them to be very close together. Row 12,13,14: Using your base colour of the slipper, single crochet around three times. The boys are getting older and bigger every day. It doesn't feel like that long ago Benjy was born and now Johnny is already 17 months old. Here is a recent picture of the two boys together. Benjy's speech has totally exploded and Johnny's personality is really starting to stand out. I love my two little boys and they keep me very busy. Due to copyright issues, I will call this the Blue Train Hat. 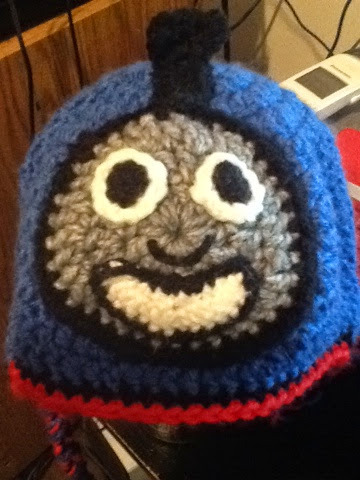 It is based on everyone's favourite tank engine though. It's very simple to make. Materials for a young child size hat. Row 7-13 : Ch 3 and put 1 dbl crochet into each st, sl st to beginning of first st. Leave a long thread of yarn to weave in with yarn needle and cut. Ear Flaps should be roughly 3 inches from front and 2 inches from back. I try to try it on my kids when I am putting them on, but if you have no kid fold hat in half, measure 3 inches, put in first stitch, then 9 single so 10 altogether. Single Crochet around hat in black and red, ensuring that you evenly spread stitches on ear flaps and make 3 single crochets in the points of the ear flaps. If you want tassels, measure arm length amounts of red, black, and blue and pull through point on ear flap, braid and tie off. Sew pupils to eyes with yarn needle and black yarn. Assemble: Sew mouth to train face. Sew eyes to train face. Embroider half crescent between eyes for nose. Funnel: Chain 6, turn sc up and then back down ( so you have 3 rows). Then Chain 2 and sc back to other side, chain 2 and sc back to middle. Essentially you are making a T. Cast off. Sew to hat: Fold hat in half to get the front of the middle, and place face on the middle. I recommend laying on a table to ensure that everything is straight as you sew it on. ( I had to resew on the face as the eyes were crooked the first time). Sew the straight part of the funnel on the hat, but not the t-part. It will stick up a bit creating a 3-d effect. I don't write down patterns often so if there are any mistakes, comment and let me know. The kids are growing faster and faster. Johnny is 11 months old and Benjy will be 3 in April. It seems just like the other day they were itty bitty babies. Not anymore. I' m back at work now so my time is very limited. 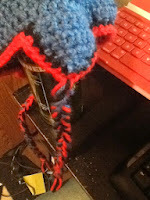 Other than playing with the kids when I get home, I've really worked on crocheting. I made all of us hats. I'm working on my first granny square Afghan. Ill post a picture when I'm done. 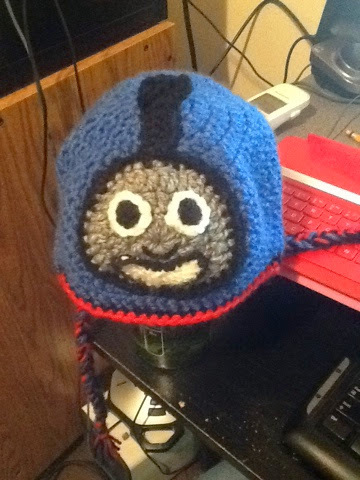 I've been really experimenting with different things with crochet and if I have time, I plan on posting some. Well I have to get back to work prepping for my classes so hopefully it won't be another 3 months till I post again. This is great to make with your Thanksgiving leftovers. I first made it a few years ago and its something we love to eat after the main meal. Depending on how you feel after you eat your meal, you can make this right away with the leftovers but instead of baking right away, put it in the fridge and then bake it the next day in the oven for 40 mins. 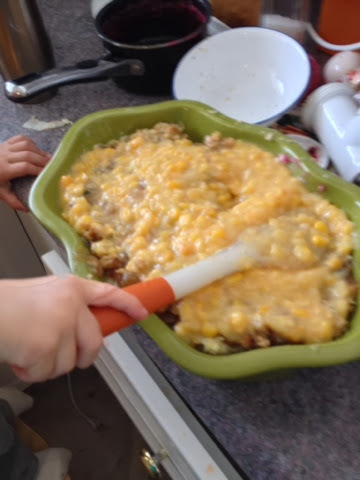 Grease casserole dish. Place ground turkey in botton the dish. It should completely cover bottom. 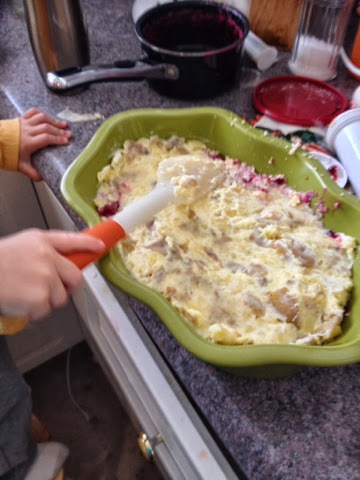 Place blobs on cranberry sauce on top. Put stuffing on top of that. I didn't have too much stuffing left but I spread it out the best I could. The cover with creamed corn and spread out. Place completed casserole in the over for 20-40 mins depending on how warm you want it to be. 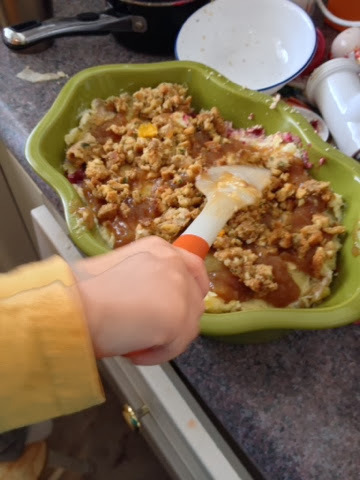 turkey, cranberry, stuffing, creamed corn, gravy, then mashed potatoes. I boiled the turkey carcass when I removed the meat for about 2 hrs. I then strained out the chunks and had broth left over. I love how easy mashed potatoes are to make when you leave the skin on. 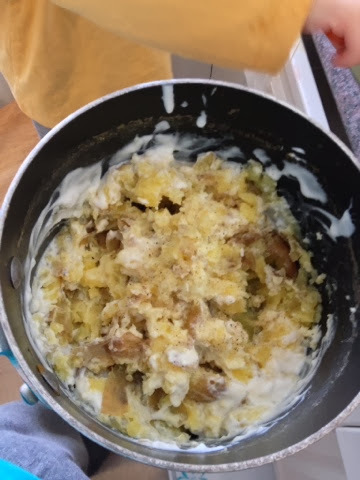 Quarter the potatoes and boil until you can stick a fork into them easily. Use a masher and mash them up. Add the sour cream and salt and pepper to taste. This makes creamy tasting mashed potatoes without a lot of added fat. Preheat oven to 350F. Grease a 9×5-in. loaf pan. 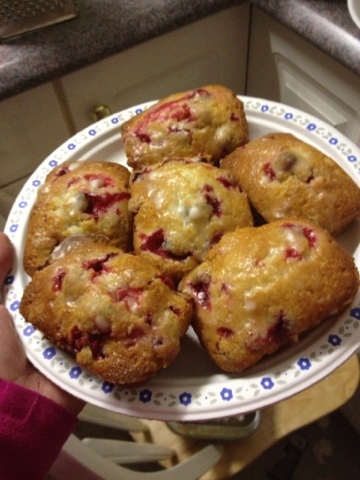 Stir flour with baking powder and salt in a small bowl. Stir in lemon zest. 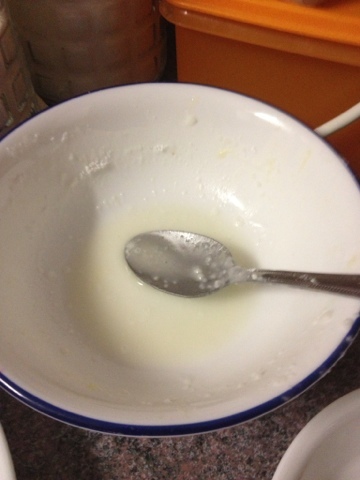 Beat butter in a large bowl, using an electric mixer on medium. Gradually beat in sugar. Beat for 2 min. Beat in eggs, vanilla and milk. Fold in flour mixture just until combined. 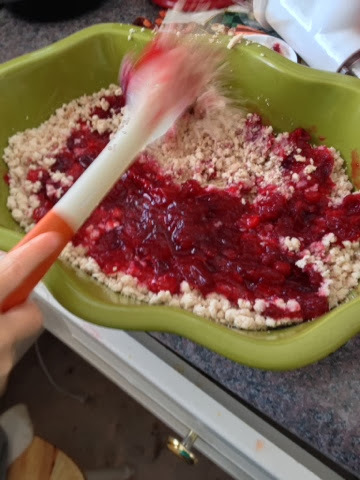 Add cranberries. Don’t overmix. 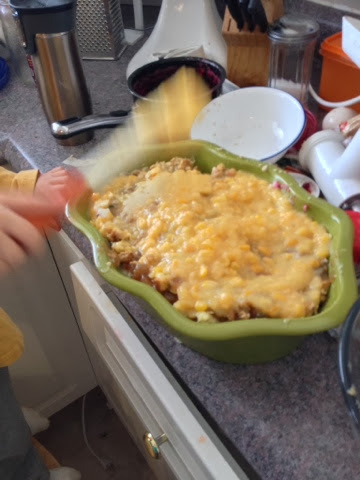 Pour into loaf pan and smooth top. Bake in centre of oven until golden and cake tester inserted into centre of loaf comes out clean, 55 to 65 min. Don’t worry if the tops of your loaf cracks: Because it sets before batter has fully risen, it will split as it bakes. Transfer pan to a rack. Cool loaf in pan 10 min. Stir icing sugar with lemon juice in a small bowl until smooth. Brush glaze overtop warm loaf, letting glaze run down the sides. Let cool completely in pan. I've made it in a loaf pan which is more 8 by 3. 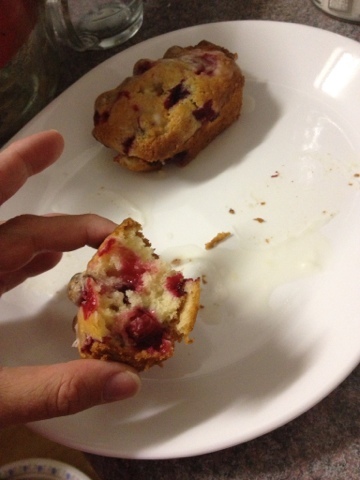 I also used my mini loaf pans and cooked it for about 40 mins. 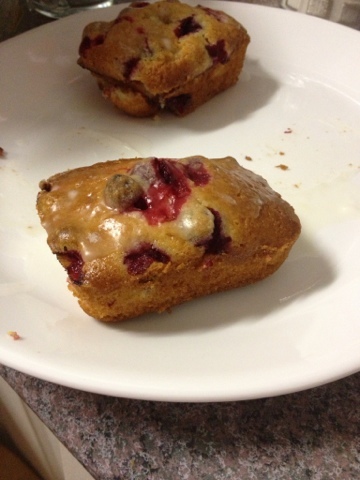 The cranberries add a great flavour as they burst open as the loaf cooks. A Journey to Our BABY! I am 29 and have been married for10 years. My DH , The Chief, and I have 2 sons, Benjy and Johnny. Our cat Bacon is getting used to his new pals. 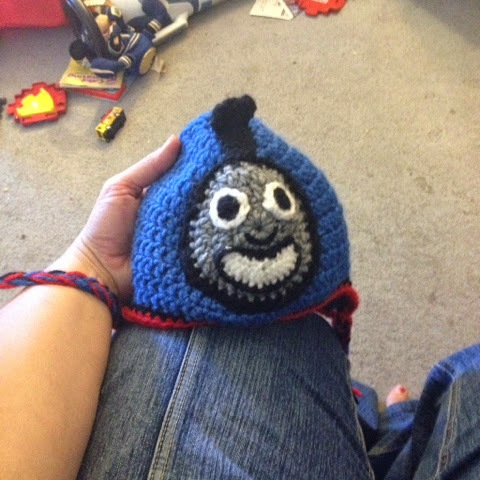 This blog is to talk about family, crafting, and things that were useful to me.